This year I decided I’m going to be more glam when it comes to sewing for myself. My first project for the year is this little black dress. I can’t believe with all the sewing I did last year that I didn’t even own one. 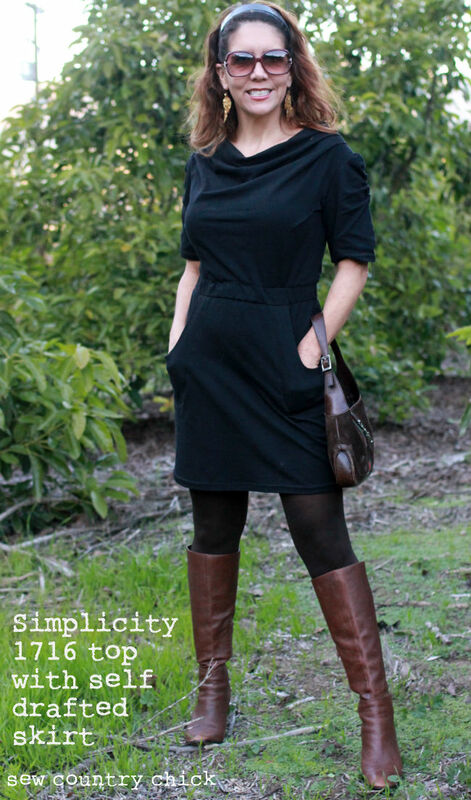 This is a perfect cool weather dress and is made from a heavier wight cotton lycra. I used the pattern Simplicity 1716 for the top of the dress and drafted my own pocketed skirt and elastic waistband. The boots are by 9 West and I’ve had them for years. I used the top from view E and the sleeves from view C.
I cut it in a size smaller than recommended as I usually do in these types of patterns. They always run big. Sometimes as much as 2 or 3 sizes! I’s love to make another in view D in a slinky knit for spring. I think the pattern is really well designed and the instructions were simple to follow. I like the little pleats down at the bust and the shoulders. I love the ruching on the sleeves too. I cut the top with a two inch seam allowance at the waist so I could make this elastic waistband. After viewing a few versions of this pattern as a dress I decided I would have to do a Frankenpattern as it looked too boxy. I love pockets! These types of pockets are pretty simple. Maybe I will do a tutorial for how to make them. So now that I have my little black dress under my belt as they say, I am working on some skinny black pants, another basic I desperately need! How about you? What are you planning on making for yourself this year? What a pretty little black dress. Looks comfy too. and looks great on you..
Love it! And I love how it looks comfy and dressy at the same time! Yes it’s super comfy. I could sleep in it! Thanks Melissa. Having giant glasses on helps! You DO look great. I am glad you decided to get more glitzy for yourself in the new year! I followed a link to Lily’s First Communion dress. Oh my goodness, was the group shot of them too precious? Those boys look like little mafioso’s and up TO NO GOOD! The girls are absolutely perfect! I am inspired by you for my number two resolution: Sew more clothes! Thanks Brandi. I loved that photo too! looks great! and you’re working it! I love your dress, you look fabulous and what a great wardrobe staple I’m sure that will prove to be for you. I do like the pockets too, I’ve found pockets so lovely for dresses whenever I’m without it’s terrible. This is lovely, well done! It looks elegant yet easy to wear. 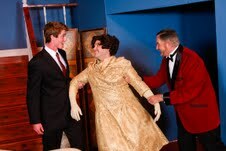 I’m hoping to ‘conquer’ the dress this year, after a few not-so-great attempts in the past! very cute! all the best for 2013 sewing adventures. So chic, Justine! You look fabulous! The dress looks fab on you! This turned out so beautiful! If I made one for myself I’d probably make it a bit longer for myself, but that looks adorable on you! AND I’m hosting a BRAND NEW “The Great Blog Train” Blog Hop: http://blueeyedbeautyblogg.blogspot.com/2013/01/new-great-blog-tain-blog-hop.html. P.S. I’m now officially following your blog via GFC! I’ve been following via email for awhile now and love your blog! Wow, you look great. I love the whole look. I don’t have an LBD either – casual or dressy. That’s probably something I need to remedy this year, too. That dress is super cute. Is currently making a top from the same pattern. This gives me some ideas for future projects. Thank you for the inspiration! I totally need this! I can see wearing it all spring and summer. Nice dress, looks comfy. You’re right everyone needs a little black dress in their closet, I’m embarrassed to say I don’t have one either, maybe that should be on my list of things to sew for myself this year.